Toilet paper is an essential daily paper for people. 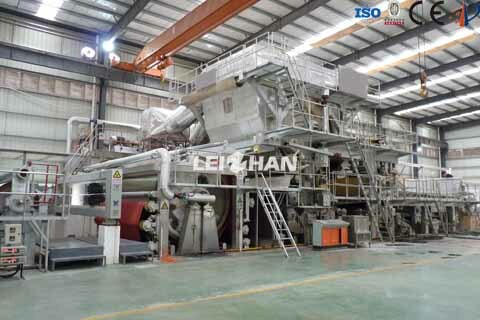 5500 High Speed Tissue Paper Machine can suit for various raw material, such as cotton pulp, reed pulp, bagasse pulp, wheat straw pulp, wood pulp and waste paper pulp. Pulping: Chain Conveyor, Bale Breaker, Drum Pulper, D Type Hydrapulper and High Concentration Hydrapulper and so on. Screening: Middle Concentration Pressure Screen, Drum Screen, Vibrating Screen, Inflow Pressure Screen and so on. Refining: Double Disc Refiner, Conical Refiner, Fiber Deflaker.